The Mazda MX-5 Super Series has had to all intents and purposes a positive and successful first year, and the final rounds at Donington Park in Derby helped see out the season in the best possible way, sporting its biggest grid since its inception with more fantastic racing in store for all involved. Alongside the regular Super Series drivers came a raft of new additions to the grid, both familiar and new names. 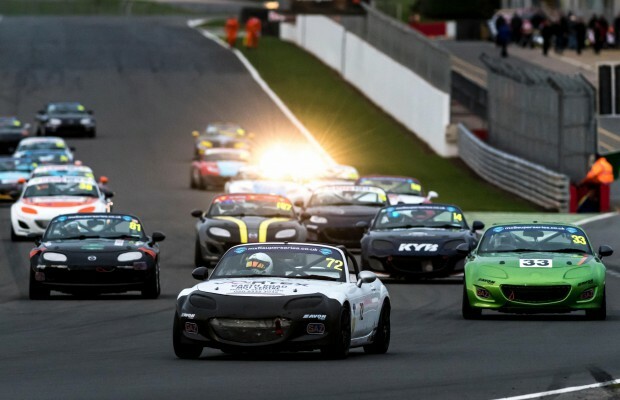 MX-5 SuperCup regulars Garry Townsend and Bradley Kent were present for the final rounds, while newcomers came in the form of Tom Smith, William Stowell, David O’Reilly and Jude Worley, daughter of Boreham Motorsport boss and double MX-5 SuperCup Masters champion Ray. This in turn saw a 22 car grid to complete the season, leaving everyone high in anticipation for another thrilling weekend. There were no surprises in qualifying as the two fastest drivers in the field once again took up residence on the front row for the first race, with Joshua Jackson on pole alongside season long sparring partner Jake Bailey. Between them, the pair had taken the lion’s share of race victories all season and Donington Park looked set to see business as usual at the front. Richard Breland and James Kell completed the second row ahead of Sam Bailey and Garry Townsend, with Alex Livesley, Jeremy Crook, Joseph Marshall-Birks and Patrick Collins completing the top 10. Further down the grid, new boy Tom Smith was 13th, Bradley Kent couldn’t better 15th fastest and Jude Worley lined up on the back row of the grid eager for his first taste of the Super Series. While Jackson initially tried to escape in the lead from the start, Jake Bailey ensured he was reeled back in by the completion of the opening lap as the pair quickly established a gap at the front. This left Breland, Townsend and Livesley together scraping for 3rd where eventually Breland would break way on his own and unchallenged in the final podium spot. Lap after lap, Jackson and Jake Bailey ran nose to tail in something of a deadlock as the spectators waited for the battle to kick off, but the long awaited move didn’t come until Lap 8 when Bailey just found enough room to squeeze down the inside at Redgate and seal the pass. By this time and further back in the pack, James Kell had thrown himself into the 4th place fight with Livesley, Sam Bailey and Townsend as the quartet circulated together in a fascinating scrap. Back at the front, Jackson was taking up the role of pursuer as he aimed to repass Jake Bailey, however the pair had been steadily reeled in by Breland and by lap 11 the gap between the trio was less than a second. At one stage, Jackson was able to look back up the inside into Redgate to try and repay the favour, however Bailey stuck in front while Breland watched on in 3rd place. From there, however, there was no more chances as despite being glued to Jake’s bumper in the closing laps, Jackson just couldn’t find a way back through. Jake Bailey took the win from Jackson and Breland with the top 3 covered by less than a quarter of a second, while Alec Livesley won the 4-way skirmish for 4th place ahead of Kell, Sam Bailey and Townsend. Patrick Collins took 8th place ahead of Jeremy Crook in 9th and Geoff Gouriet in 10th. The first start of race 2 was red flagged at the end of the opening lap due to Patrick Collins taking a hefty hit into the wall inside the exit of Starkeys. On the second launch, Jake Bailey initially got away cleanly but battling with Jackson on the run to Coppice saw him miss his braking point and tumble down to almost last with a lot of work to do to climb back up the field. This left Jackson in a lead in which eventually he would not lose, despite the best efforts of Alec Livesley and James Kell respectively. By the time the chequered flag flew, Jackson had led every lap and managed to win by 2.5 seconds, while 2nd place went to a delighted Kell who had strived for a podium in his first season since his turn in form. Livesley did finish 3rd on the road, but a 15 second time penalty for track limits abuse pushed him down to 6th, giving Richard Breland his second podium of the weekend. Jake Bailey put in a superb recovery drive to storm back through to 4th place ahead of father Sam, with Livesley, Kent, Townsend and newcomer Tom Smith completing the top 10. The circuit was bathed in a warm, orange Autumnal glow by the time the final race of the weekend and the season came around on Sunday afternoon, and with the sun setting it was the perfect backdrop to round off 2018. Jackson once again led from the start with Kell and Breland in tow through the opening lap. Jake Bailey wasted no time from 4th on the grid to pick off Kell for 3rd and then Breland for 2nd to make up two places in as many laps, with Jackson once again firmly in his sights. This time, he didn’t hesitate to take the lead as he passed Jackson on Lap 5 and put his foot down to try and escape up the road. As usual, Jackson refused to make it that simple and hounded the #14 over the next few laps in an attempt to set him up for a repass. Jackson drew alongside on a couple of occasions heading towards Redgate but each time, Bailey held firm with no way through. However, with three laps to go the gloves came off as Jackson prized open a gap into Redgate corner despite contact being made. As a result, Jake Bailey went tracking through the gravel and lost a few seconds as a result but maintained 2nd place. The positions remained unchanged until the flag and Jackson rounded off an incredible season with yet another win. Jake Bailey felt a little aggrieved to miss out with 2nd place once again, while father Sam took up 3rd place on the final podium of the season. He had to see off both Kell and Livesley in 4th and 5th, followed by Breland, Robert Cox in 7th place, Joseph Marshall-Birks, Jeremy Crook and Tom Smith. No one can deny that the first season of the Mazda MX-5 Super Series has been a total success and with more interest for 2019 and more cars and drivers expected on the grid, it should be another sensational year of racing. Thank you to all of our teams and drivers for making it so special and we’ll see you again next season!